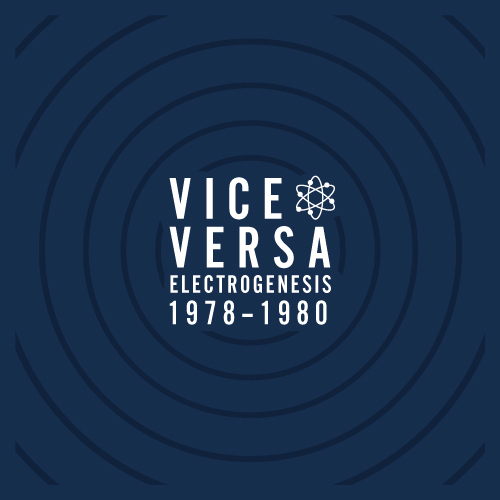 Vice Versa formed in late 1977 / early 1978 by Stephen Singleton with Mark White and David Sydenham as members and can be considered as one of the "Big Four" late 70's minimalistic electronic/synth-based bands from Sheffield. Together with the other three big Sheffield-Protagonists of electronic music; Cabaret Voltaire, Clock DVA and The Future / Human League they heavily influenced and changed the guitar-dominated British Pop Music Culture in the late 70's to early 80's, especially when in late 1980 Vice Versa decided to change their name to ABC and to take a more modern and commercial pop orientated path to receive worldwide success and fame. Their first concert took place at the Doncaster Outlook club supporting Wire and the first major Sheffield gig was with The Human League at the Now Society at the Sheffield University and it was called 'Wot, no Drummers'. In late 1978 Stephen and Mark founded their own independent record label called Neutron Records to release their own music as synth-based music still kept being ignored by the major music-industry and music-labels. In their anarchic beginnings, the Neutron-label itself was conceived an independent, marking a distinctive path between music and packaging, regarding their material as manifestos focusing around subversive matters of the post-modern and anti-art principles. Although fairly obscure as the Sheffield underground scene ran predominantly local. Vice Versa still succeeded in gaining particular public attention with their own blend of electronic pop tendencies, largely inspired by the Punk explosion, the post punk fall out, and the electronic Sheffield music scene at the time. As purveyors of fine product, Neutron made sharp, intelligent statements for the new decade - Vice Versa's 'Music 4' (7" EP, NT001) is a brilliant piece of electronic pop linked with cut-up statements on social decadence. Further two releases, even more ambitious in that matter were a set of prints and a manifesto (NT002), to be finally concluded with a semi-legendary six-sided fold out '1980: The First Fifteen Minutes' (7" EP, NT003) - alongside Vice Versa, further three then-local groups - Clock DVA, The Stunt Kites and I'm So Hollow contributed one track each for their first proper vinyl exposure before getting their own record deals ever after. It also won a famous 'single of the week' line in NME, much to the surprise of the group. his fanzine Modern Drugs, he interviewed Stephen and Mark and then never left. During 1980 Vice Versa made two more releases - an excellent cassette '8 Aspects of' followed by another vinyl cut for the two tracks, 'Stilyagi/Eyes of Christ' (7", BBR 003) remixed from the very cassette at the Backstreet/Backlash Studio in Rotterdam. When they went over to Holland on tour and they were invited to jam in a studio in Rotterdam. Martin Fry started to improvise on vocals and everybody was surprised by the quality of his voice. They decided to make him the lead singer of the band and spent about a year writing new songs, thinking of a new name and concept; this progress being the Vice - Versa to ABC-transformation. The whole project has been overseen and curated by Stephen Singleton and Mark White. The box set includes an extensive 40 page lp-sized history of Vice Versa and Neutron Records with many unpublished photographs and unseen original artworks, a metal enamel Badge, 4 full-colour printed innersleeves and in honour of the venue that gave Vice Versa their first opportunities at Sheffield university the Box also includes a paper kit synth called 'nowsoc78' which the buyer of the Box-Set could assemble themselves with scissors and glue. All original Vice Versa Recordings from 1978 to 1980 are contained on this deluxe finelinen and embossed Box-Set containing a total of 45 different Versions and incl. 30 previously unreleased versions and 3 previously unreleased tracks: With a total running-time of of almost 3 hours (114 minutes of Studio-Recordings and 56 minutes of Live-Recordings) and with more than 2 hours of previously unreleased recordings this is the ultimate "Must-Have" for any serious collector and fans of late 70's electronics/minimal/Synth. 4-2 genetic Warfare 4:22 york de grey rooms 14th december 1979 .